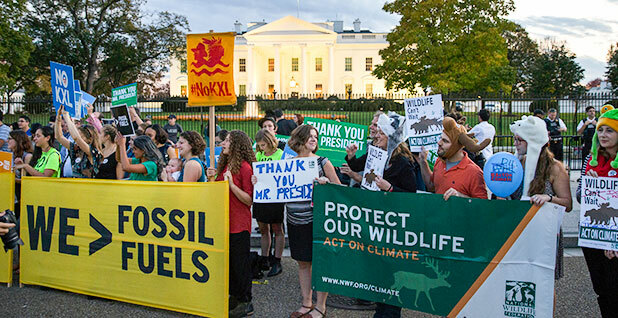 Demonstrators celebrate in front of the White House over President Obama’s rejection of the Keystone XL pipeline. The pipeline is likely to come back under a President Trump. Photo courtesy of AP Images. With a President Trump in the White House, the nation's fossil fuel debate will likely shift from "keep it in the ground" to putting pipelines in the ground. Trump, who campaigned on making America energy independent, cannot do much to accelerate drilling amid a price slump. But pipeline construction represents perhaps the fastest way to give the oil and gas industry a shot in the arm and stick it to the anti-fossil-fuel movement. "I think they will greenlight lots of fossil fuel projects," said Jane Kleeb, who led the fight against the Keystone XL pipeline and rallied activists against the Dakota Access pipeline. "And we'll fight all of them." During the campaign, Trump vowed to revive Keystone, and many observers expect he'll try to end the delays on the Dakota Access pipeline. And there are several other major pipeline proposals being pushed by the industry and opposed by green groups. During his acceptance speech yesterday, Trump said, "We're going to rebuild our infrastructure, which will become, by the way, second to none." The oil and gas industry is enthusiastic about the potential to stop playing defense on the pipeline issue. Industry figures say President Obama blocked the Keystone XL pipeline and delayed the Dakota Access pipeline to appease environmental groups. "We're hopeful the pipeline approval process will now be allowed to work without political interference," said John Stoody, vice president of the Association of Oil Pipe Lines. Reinforcing the point, pipeline developer TransCanada Corp. issued a statement yesterday that it is "evaluating ways to engage the new administration" on its proposal (E&ENews PM, Nov. 9). The stock market is also on board with the concept of more pipelines. Energy Transfer Partners, which is building the 1,172-mile Dakota Access pipeline, saw its stock price rise 11 percent yesterday. Trump has vowed to get the oil industry out of its doldrums by sweeping away regulations. But even though there are a number of regulations looming for the industry, the current price slump was caused by overproduction. Pipelines are key to Trump's promise to revive the industry, said Salo Zelermyer, a former George W. Bush energy official who is now at Bracewell LLP. "Trump has made it clear that he wants to unleash domestic oil and gas production, and it is clear that we need the infrastructure necessary to maximize the benefits of that production for jobs and the economy," he said. While the future regulations haven't slowed the rigs, they have discouraged investment in projects that could open more markets for industry, said Stephen Brown, vice president for federal government affairs at oil refiner Tesoro Corp.
"It's the overhang of these regulations that become a drag on the economics," Brown said. "Your cash is drying up." The industry is hopeful Trump will not only speed up pipeline approvals but roll back the regulatory regime Obama has proposed, including a crackdown on methane emissions from the oil and gas sector and expanding the scope of the Clean Water Act by broadening the definition of "waters of the U.S."
"Whenever people try to permit virtually any kind of facility, it's a moving target," said John Tintera, executive vice president of the Texas Alliance of Energy Producers. Industry officials say rejecting "keep it in the ground" will be politically helpful to Trump. "We need more energy infrastructure, and the workers who will build it know that the radical environmental groups preaching 'keep it in the ground' are not their allies," said Steve Everley of the industry campaign Energy In Depth. Kleeb foresees political pain for Trump and the industry on pipelines. Rather than focus on climate change, she said she expects to press the case that land for the pipelines is being acquired through eminent domain. That's an unpopular concept in rural areas. "We will battle them in the courts and streets," Kleeb said. "That's the two places they don't control." Finishing the Dakota Access pipeline now seems as simple as granting an easement that the Obama administration has blocked. But industry advocates are wary that the Obama administration can use its final few months to make it more difficult. Energy Transfer declined to talk about the potential impact of Trump's policies on the line. The company plans to finish the Dakota Access line by the first quarter of 2017, Vicki Granado, a spokeswoman, said in an email. The Standing Rock Sioux Tribe, which fears the pipeline will contaminate water and disturb burial grounds, called on Obama to block the Dakota Access before he leaves office. "We believe halting the Dakota Access pipeline presents a unique opportunity for President Obama to set a lasting and true legacy and respect the sovereignty and treaty rights of Standing Rock and tribal nations across America," Standing Rock Sioux tribal Chairman Dave Archambault said in a statement. Restarting Keystone would be more difficult than finishing Dakota Access. Since the project was canceled, TransCanada would essentially need to start over. "You're looking at two years of a fight," Kleeb said.